Solid State Drives - An Improvement Over Traditional Storage Drives. What are Solid State Drives? SSDs or Solid State Drives are non-magnetic storage media that do not use any spinning disks or moving mechanical components. The SSD drives are made of Flash controllers and NAND memory chips. These components enable speeds in handling sequential & random data requests. The SSD drives, unlike HDD, are not prone to physical failures. Making them popular option amongst other storage media devices. The SSD drives have a fast read/write time, consumes low power. Thus making them preferred choice for enterprise systems that need high-performance workload handling. The world's first hard disk drive (HDD) was brought to life by IBM through the RAMAC 305 System. Although they were massive and expensive back then, hard disk drives have since then evolved. They have become more affordable, grown in capacity, and come in smaller sizes. Unfortunately, hard disk drives aren't invulnerable. They're prone to data loss when the read-write heads touch the spinning platters. In this context, since SSDs are not likely to physical crashes, they are a popular choice. A Solid State Drive works like an independent part. The main advantage of using SSDs is that it's not prone to physical wear or tear or damage. SSDs are designed to be shock-resistant and to operate silently on your PC. Solid State drives boot up faster, close PC applications quicker which improves the PC's performance. You get higher transfer rates, more robustness, and zero noise. Since SSDs don't use magnetic sections and read/write heads, there are no issues related to facing mechanical lags. Conventional HDDs use the read part of the read-write heads to hover over to the magnetic section of the platter to read data. Typically, data is read fast, if arranged sequentially. But, when you have files that are fragmented and not in sequence, they can lag. This is where the SSDs trump HDD. SSDs are more reliable than HDDs not being prone to shock damage. Since there are no moving parts, you don't have to worry about mechanical failures. SSDs come in different form factors such as 5.25 inches, 3.5 inches, 2.5 inches, etc. The form factor of the SSD depends on its use-case and where it's installed. Desktop and enterprise systems use 3.5-SSDs while ultra-mobile applications use 1.8 inch SSD's. Now SSD's have become smaller in size to accommodate the portability factor. SSDs are more power-efficient than HDDs merely because they aren't prone to mechanical lags during the shutting down of the OS. This leads to an increase in battery life in laptops and notebooks. SSDs use microchips like memory cards. The HDDs use magnetic read/write heads which move around. Modern-day SSDs offer storage capacities of 10 TB and above. While the HDDs offer up to 40 TB of storage space. But, manufacturers have announced to release 100TB SSD devices soon. This will overtake the HDDs, thus making it a promising storage device. The life cycle of SSDs depends on their storage types. There are mainly three types: SLC (Single-level Cell), MLC (Multi-level cell), and ELC. Single-level cell (SLC) NAND stores one bit of data per cell (in 1s or 0s) while multi-level cell NAND stores two bits per cell. The lifespan of SSDs is linked to their write cycles. Some SSDs have a virtual SLC-mode which emulates single-cell storage types, writing one bit of info per cell. After space runs out, these SLCs operate in standard storage procedures. A rule of thumb is that the more data per cell stored, the faster it wears out. This which is why MLCs wear out more quickly when compared to SLCs. SSDs don't wear out if they're read-only, with multiple read-write and delete processes, they wear out. MLCs last for about 3,000 write cycles per physical sector while SSDs with an (SLC) NAND flash last for approximately 100,000 write cycles. If an SSD has more storage cells, it will last longer since data is apportioned carefully, thus minimizing the need to be rewritten often. There are different types of SSDs in the market. 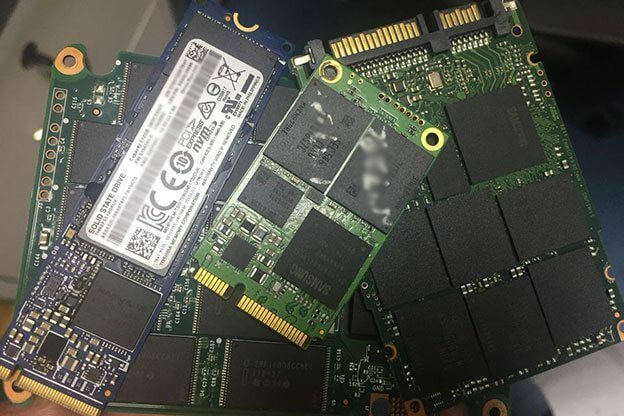 SATA SSD -SATA is known as 'Serial ATA' and is a type of interface which connects your SSDs to devices. NVMe SSD - Non-Volatile Memory Express is a type of host controller interface that speeds up data transfer between client and enterprise systems, SSDs, and computer peripheral components. NVMe support NAND flash SSDs and 3D X Point Technology. PCIe SSDs - PCles are expansion cards which boost transfer rates between peripheral components and SSDs. SATA SSDs have a peak bandwidth of up to 6 GB/s and perform at 555 MB/s in real-world overhead tests. An NVME SSD has five times the peak bandwidth of a SATA SSD and transfer speeds peak at 3GB/s. They also have the added advantages of handling heavy workloads better and have improved latency. SSDs have faster transfer times, increased battery life, and consume less power than HDDs. Despite their benefits, they more prone to failures and malfunctions compared to HDDs. The worst part is not being able to spot if they're functioning correctly or not. HDDs give out specific noises when they're failing, but SSDs don't. Power surges or failures may lead to SSDs malfunctioning. SSDs use a capacitor, and a power supply and can corrupt existing data when power failures occur. SSD Bad blocks are the equivalent of bad sectors of HDDs. Symptoms of bad sectors involve not being able to read/write to the SSD. Freezing up of applications, slow performance, and repeated errors when transferring files. SSD controllers connect the device's flash memory components to its input/output interfaces. If the controller fails, the device and even the SSD disk recovery may not work. Bugs in SSD firmware prevents the firmware from being updated, leading to firmware damage. This is another reason behind SSD failure. Every time you write data to an SSD, the store cells which hold the data degrades steadily. This process continues until the cells can't keep any more data and additional writes become impossible. SSDs use semiconductor technology and use no moving parts. SSD data recovery is complicated as compared to hard drives. SSD are prone to following errors. 3. 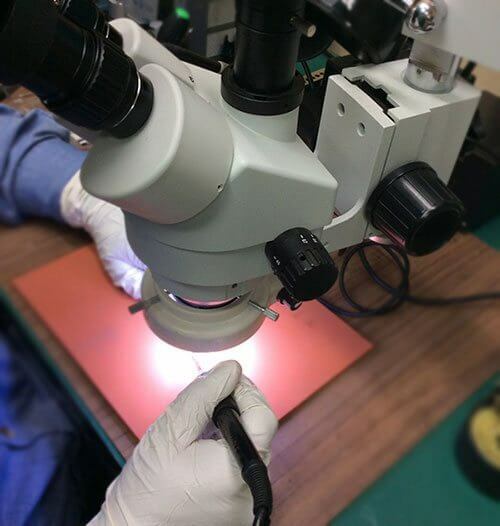 NAND manufacturing defects, use of epoxy like substances on NAND chips. 4. Overheating due to high-speed transistors. You'll find relief in knowing that SSD data recovery is still possible. If it's your first time opting for an SSD drive recovery, it is advised to go for Stellar Data Recovery Services. When you send your SSD to Stellar, it is sent to a Data Recovery Lab where it's analyzed and diagnosed for data loss. A specific scanning technique is used by expert technicians who locate the used areas of the SSD and create an image out of it. This image allows Stellar to recover lost files from those sectors, thus making data retrieval possible. If your SSD isn’t physically damaged, you can use software like Stellar Windows Data Recovery for retrieving lost files. Data recovery from SSD is not foolproof which is why it’s recommended to hand it over to the experts if you suspect your SSD is failing as a result of firmware damage, or bad sectors. Do Not Defrag - Defragging works for HDDs where files are read/written sequentially but SSDs are restricted to that. Defragging is not only a significant waste of time but ends up eating away at your write cycles by erasing and writing data regularly (SSDs don't overwrite directly). Disable Indexing - We mentioned earlier SSDs can access files from any sector and are not reliant on sequential reading/writing. Indexing keeps tracks of file read/write edits and chips away at SSD writing cycles. Disable it. Period. Turn on TRIM Support - When you delete files, windows deletes the index numbers to indicate that space is available for new files. The actual overwriting takes place when you add new files. The TRIM command marks sectors to be cleared during idle time and wipes the available space for clever writing on SSDs. Update Your Firmware - Bugs and lack of firmware updates lead to firmware damage. By updating your firmware, you improve your chances of SSD Hard Drive Data Recovery and prevent crashes. Protect The Power Supply - Take measures to protect your SSD devices against power surges, fluctuations, and low-power conditions. Monitor Your Usage - Do not overuse the SSD by maxing out its capacity limit. Check how often and how intensively you're using it. You can recover SSD data and extend your device's lifecycle this way. HDDs are limited by their spinning platter drives and max out at a storage capacity of 40TB. Present-day SSDs offer storage options of 16TB and above, with manufacturers working on releasing 100TB SSD very soon. Storage capacity is no longer tied to form factor as SSDs come in different sizes. HDDs wear out due to physical limitations and damage. SSDs wear out due to their limited write cycles, but manufacturers have mitigated this. Wear-levelling and over-provisioning reduce the number of times data is written to specific cells (thus lessening their degradation over time). Although it's true that SSDs are used for handling heavy workloads and offer blazing transfer speeds, they are not limited to just those two things. SSDs can be used for reducing power consumption, it requires fewer drives and servers, and it takes up lesser rack space than HDDs. An SSD works best when it's fresh out of the box (FOB) when there are no data blocks to be overwritten. SSD speeds and performance diminish with time when these blocks are filled up quickly. To counter this problem, a technique called garbage-collection is employed. This pre-erases the existing blocks in SSDs which makes them available when writing requests are made. Over provisioning of drives frees up space, thus needing fewer erase cycles as well. Although SSDs are robust and reliable when compared to hard disk drives (HDDs), they aren’t perfect. Send your SSDs to stellar data recovery services. They have 95% success rate where SSD file recovery is concerned. If you’ve accidentally deleted your files and your SSD is in working condition. 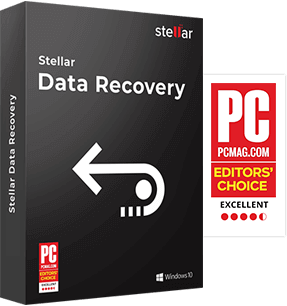 Then you can try our Stellar Windows Data Recovery software for recovering your data. SSDs are your go-to option if you're looking for a file storage device that's reliable, and not prone to mechanical failure. 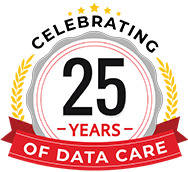 With so many manufacturers and variants releasing, it's a no-brainer why they are becoming a smart data storage choice for users.